Abby the Librarian: Fizz Boom Read: Self-Directed Science Activities! We've kicked off our summer of Fizzing, Booming, and Reading, and the Summer Reading Club is going full-force. While we have lots of fun programs planned for the summer, I wanted to talk about some of the self-directed science activities we've got around the library this summer. We've only had them up since Monday and already they've been a HUGE hit!! Our Science Explorer Table. 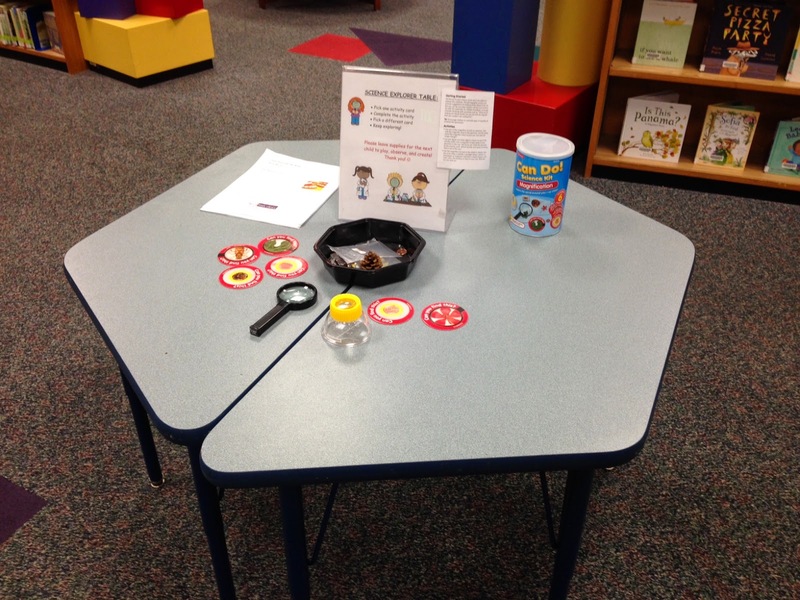 For the summer, we've replaced our make-and-take craft table with a Science Explorer Table. Last summer, it was cumbersome for staff to supervise and stock a craft table. This table, with science activities set out for self-directed exploration, is MUCH easier on staff. We straighten it up as we walk by, and otherwise we let kids and families interact with the materials. Shown on the table is the Can Do! Magnification Kit from Lakeshore Learning. It includes magnifying glasses, several small objects, and challenge cards so even kids who can't read yet can get an idea of what there is to do on the table. We purchased several of the Can Do! kits to rotate throughout the summer. While the kits are certainly convenient, you don't need to purchase a fancy kit to give kids a science experience this summer. Put out magnifying glasses and a variety of objects - interesting rocks, leaves, stamps, magazine pictures, etc. Put out rulers or a scale with a variety of objects to practice measuring. Use blocks and cars to demonstrate motion. Put out magnet wands and variety of objects so kids can test what sticks to the magnet (be careful with magnets - they are harmful if swallowed!). Science Viewers. 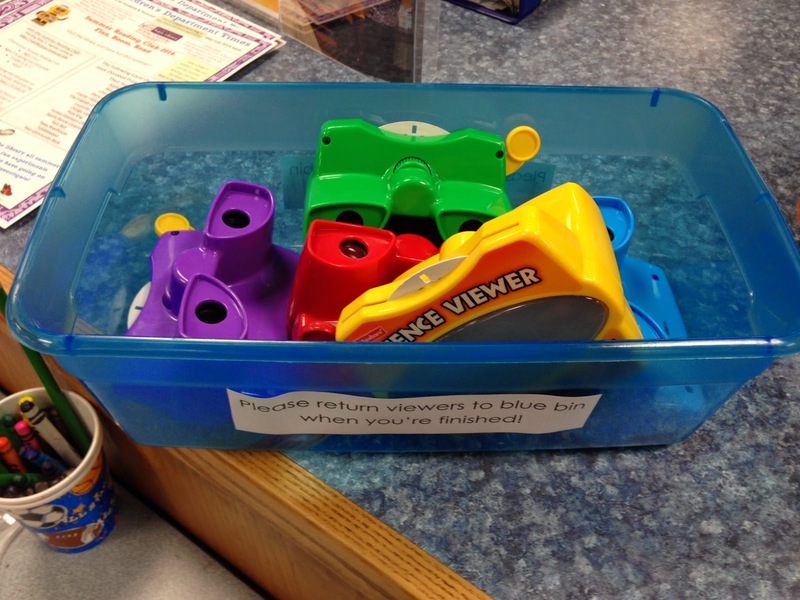 We also purchased a set of Science Viewers from Lakeshore Learning. They come with sets of slides that show animals. To make life easier, we put only have one slide out for each viewer and we'll rotate the slides throughout the summer. The kids LOVE these and parents remember them from childhood. This is another easy activity that kids are really digging. Raising Butterflies! Inspired by Storytime Katie, I ordered a set of caterpillars from Insect Lore and the kids have been obsessed with them since they got here. 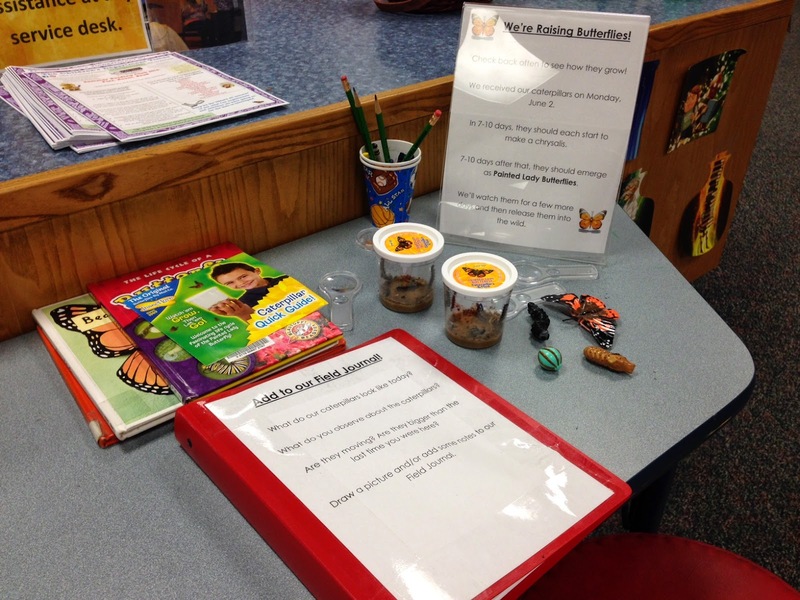 We made a little caterpillar station by our reference desk so we could keep an eye on them. We put out a binder with blank paper and labeled it our "Field Journal". We're encouraging kids to add to our Field Journal and draw a picture or write down what the caterpillars are doing (this is sneaky pre-writing and writing practice!). We also put out some books about butterflies and the instructions that came with the caterpillars in case people are curious about their life cycle or want to know when they should be making cocoons or emerging. The kit also came with plastic figures showing the butterfly's life cycle, which kids have been exploring and playing with. I always thought raising butterflies would be a lot of work, but the kids have LOVED, LOVED, LOVED them and we're doing it pretty casually, so it's not been a huge amount of work for staff. All of these have been really fun for kids and families to explore and they've been easy on staff - a huge bang for our buck! Are you doing any self-directed science activities this summer? I'd love to hear what's going on at your library!